Stop Three. The London Eye and the Millenium Bridge. 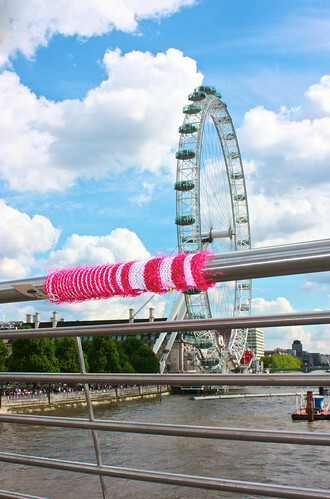 Pink Furry Knitting: So we’re going sightseeing, eh? Yay! How exciting! In Central London, you say? Deadly Knitshade: Yup. Central London. I’ll take you to see the London Eye if you like. Pink Furry Knitting: Really? The London Eye? Wow! Deadly Knitshade: And Big Ben and the Houses of Parliament. The government lives there, you know. Pink Furry Knitting: The government! Big Ben! Woo hoo! Maybe I’ll get to hear him chime! Like on the news at New Year. Deadly Knitshade: You might. And if you’re really good I’ll take you to the Millenium Bridge to look at the River Thames too. Pink Furry Knitting: Gosh! That’s ever so nice of you. Deadly Knitshade: Ah, don’t mention it. Pink Furry Knitting: And…you won’t leave me there will you? Deadly Knitshade: What do you mean? Pink Furry Knitting: Well, they… *lowers voice* …haven’t come home. Deadly Knitshade: I told you where they were. Didn’t I? Pink Furry Knitting: *mumbling* You said they got stolen by pigeons. Deadly Knitshade: What was that? Speak up. What did I tell you? Pink Furry Knitting: They got stolen by pigeons. Deadly Knitshade: Exactly. But you don’t have to worry. I spent hours making you. I wouldn’t just abandon you and let a pigeon steal you. Now would I? Hmm? *tickles knitting under chin* Hmm?